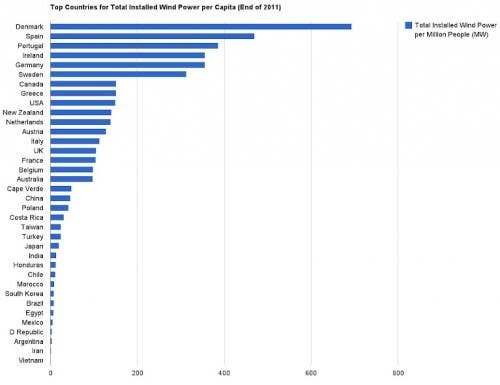 What are the top countries in the world for wind power, per capita? Take a look below! I’ve been meaning to get to this for awhile, but hopefully that means the data have just gotten better since I first intended to put this together. The Global Wind Energy Council (GWEC) does a great job of summarizing wind power growth and cumulative installed wind power capacity in countries around the world year after year. And we wrote a summary piece on GWEC’s most recent annual report when it came out in February. However, GWEC’s report always looks at these numbers on an absolute basis. While that is very relevant to many discussions, I often want to know what the top countries are per capita, per GDP, and per GWh or TWh of electricity production. So, I’ve gone and figured those things out (not difficult, of course, just requires setting a little time aside from the fast-paced, jam-packed news cycle I’m usually on in order to do so). –>Update: the Top Wind Power Countries per GDP and Top Wind Power Countries per TWh of Electricity Production posts have now been published. 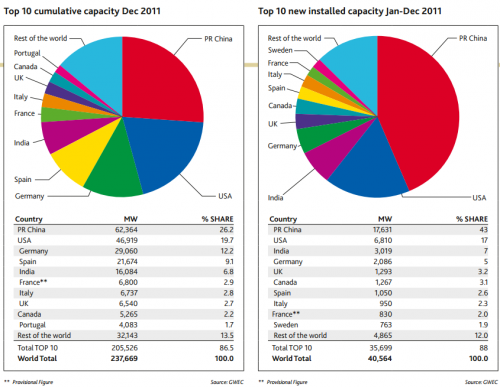 One limitation of the numbers below is that GWEC doesn’t include wind power figures for all the countries of the world. Nonetheless, it includes all the big ones (when it comes to wind power) and the list is as comprehensive as any I am aware of. One other limitation is that population figures used in the calculations were not from one source nor from one point in time — they were the most recent figures available for each country and were retrieved via Wikipedia. 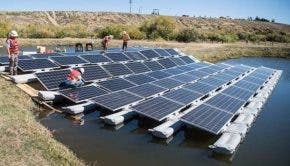 But, even if the population numbers were from the same source and point in time, I think the results and rankings would be more or less the same anyway — the more important figures to have standardized in these calculations are the MW of installed wind power. To enlarge, click on the image and then click on it again on the next page. As you can see by comparing the above charts, the US and China dominate when it comes to absolute MW of wind power (new and total), but they are quite mediocre when installed wind power is compared to population. Denmark, Spain, Portugal, Ireland, Germany, and Sweden continue to dominate when it comes to total installed wind power per capita, while the top countries in new installation capacity per capita in 2011 were Sweden, Ireland, Cape Verde(! ), Canada, Denmark, Greece, and Germany. Stay tuned for wind power leaders per GDP and per electricity production — there are some bigger surprises coming.